This flexible plastic sock aid is lined with nylon fabric on the inside that allows the foot to slide into the sock. Terry cloth outer cover provides a non-slip resistance to the sock which helps prevent the sock from slipping off the sock aid before it's snug. 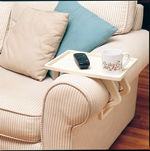 Foam handles provide a large diameter surface for those with limited grasp due to arthritis. One-handed use is possible with this sock aid. Sock aid measures 9" x 7".